20905 leads 73119 away from Horstead Keynes with a train for East Grinstead on the Saturday 16th April. 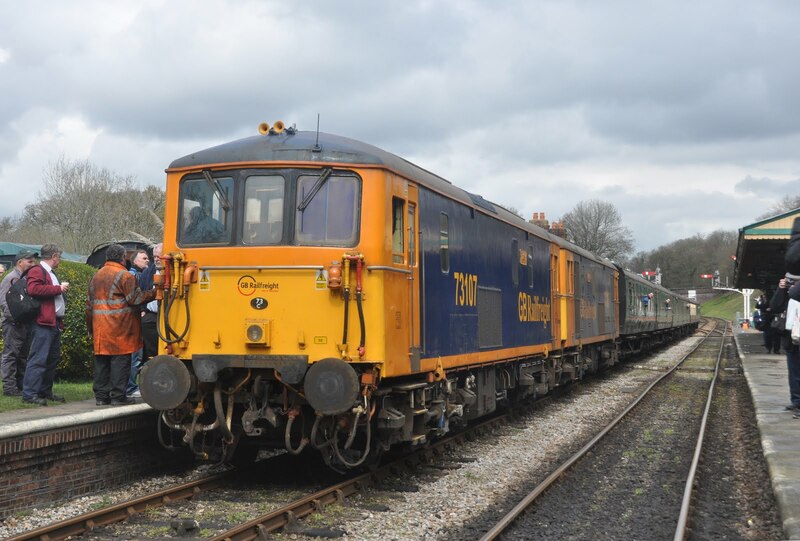 Over the weekend of the 15-17th April 2016 the Bluebell Railway in Sussex held only its second ever diesel gala. 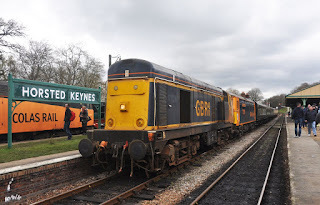 Following the success of its almost unprecedented 'Double Deltic' event last year this once 'steam only' line invited an impressive line up of seven loco's from the GBRf fleet to company it's own class 09 shunter for three days of diesel frolics. Present at the railway were 09018, 20901, 20905, 47739, 66770, 73107, 73119, 73136 and 73964 (since the GBRf handed back their class 47's to Rivera trains a Colas example instead filled in in the shape of 47739). For many the Colas 47739 'Robin of Templecombe' was a draw. 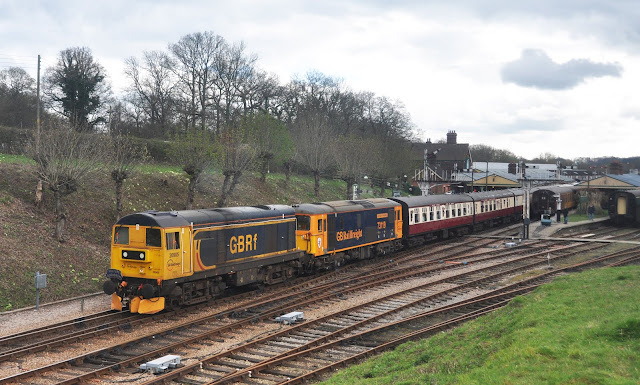 The Bluebell railway has enjoyed a close working relationship with GBRf since the companies first came together to remove spoil by rail from the former Imberhorn Tip, a key task in the railways recent extension to East Grinstead. Now that the extension is complete- and the Bluebell has a mainline connection GBRf have continued to be involved with the line with stock moves and this gala- tying in with the 15th birthday celebrations at GBRf was the prefect way to continue the relationship. failure on arrival with wheelset issues. Despite some less than agreeable weather on the Saturday of my visit the line seemed to be very busy- indeed it is reported that the queue for tickets before the first train form East Grinsted was so long that not everybody made the first train- a lesson for the future perhaps despite more than 20 minutes to transfer between Southern and Bluebell trains. Trains continued to be well loaded throughout the day with three sets of stock in use including the London Underground owned 4-TC. Later on there was the added highlight of the Beer-ex train running later into the night. Loco swaps were all carried out at Horstead Keynes on Sheffield Park bound services and for those who wanted it rides were available with the 09 on either the observation coach of the 'Queen Mary' brake van. own giving the unusual view of a GBRf 20 running bonnet first. Unfortunately both class 20's failed during the course of the Saturday with 20901 being removed from it's first up working leaving 20905 to soldier on alone- and also causing a 48 minute delay to trains. While the 'failed' 20901 did make a brief re-appearance on an evening train it was with regret that neither class 20 was in operation on the Sunday of the gala- the day where the weather was by far the best for the photographers. With the weekend of diesel delights over it will now be back to the usual program of 100% steam running for the remainder of the season- but who knows what next year may bring on this line that now seems to be full of surprises? 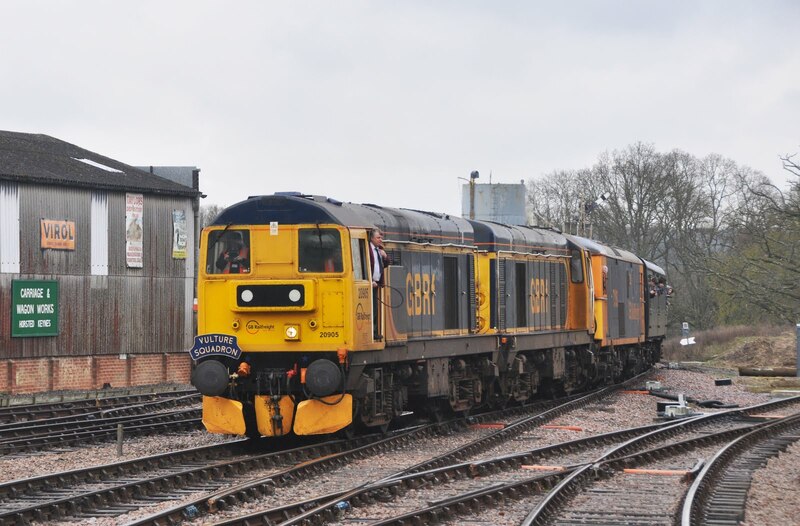 Another byproduct of the class 20's failure was the opportunity to enjoy double headed class 73's with 73107 and 73136 filling in for one round trip. The class 73/1's had only been intended for use as translator vehicles for the other visiting locomotives. Coal Decline- Steam to end at Fuxin?